Containers are engineered to support the need for continuous application changes. As self-contained artifacts, they accelerate the benefits of immutability, scalability, and portability. But there’s no such thing as a free lunch, and the ephemeral nature of containerized apps challenges teams to understand how a “now you see it, now you don’t” system impacts overall application performance. New techniques are required to manage containerized changes in the context of the highly dynamic state in which they operate. Microservices, as the name implies, break up applications into many small pieces. Teaming microservices with DevOps is considered the new path to rapidly bring business value to software applications, and Docker is the primary containerization technology that can make microservices a reality. Speed has a price, however. Breaking up applications introduces new types of issues that traditional architectures do not need to deal with. 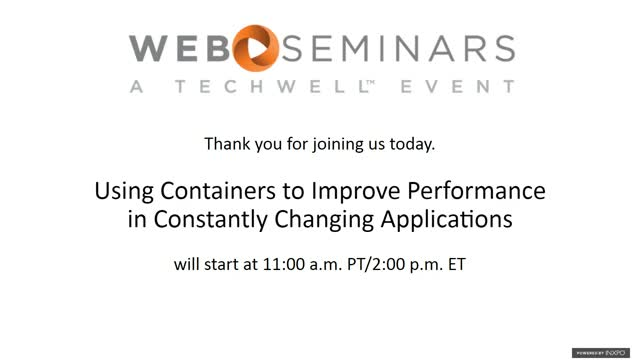 Join this web seminar to learn about five ways to tame the container chaos. During this SDxCentral.com webinar, you’ll learn how CA delivers a single and scalable operations experience with easy OOTB dashboards for NOC personnel to correlate network health with faults and events for modern technologies like Cisco ACI, SD-WAN, vCPE to traditional SNMP performance, flow and traffic analysis and TCP/Application transport analysis… in one unified platform. Containers are being widely adopted across DevOps teams to speed the development and deployment of applications but sometimes at the cost application performance and the user experience. As these new modern architectures are deployed, teams struggle to understand how best to gain performance and user insights due into these highly ephemeral environments. Traditional monitoring techniques are challenged and require a new approach. Download this webcast to learn more about essentials of monitoring containerized application environments. Application performance monitoring used to occur in splendid isolation – app support teams monitoring monolithic production systems. As such, heavy instrumentation and lengthy configurations was an acceptable price to pay for ensuring availability across applications that rarely changed. But now cross-functional DevOps teams require flexibility and faster time-to-value, with monitoring flexing to support a variety of deployment models and use-cases. Watch this on-demand webcast where we explore the modern monitoring methods needed to support a variety of container projects and deployment patterns – from small development projects to more complex container and orchestration platforms. Containers speed development, but the applications they support can exponentially increase the number of alerts and system checks. Asynchronous messaging, more dependencies and API/network centricity all conspire to overload application support teams. Furthermore, old monolithic architectures where failure conditions were known and predictable, now give way to a more complex set of conditions involving more moving parts – making manual root cause determination like trying to ‘find a needle in a haystack of needles’. -The use of advanced analytics to collect, ingest and correlate multiple conditions to a single root-cause. Containers are engineered to support the need for continuous application changes. As self-contained artifacts, they accelerate the benefits of immutability, where full systems are disposable and can be quickly reconstructed – meaning no patching and configuration drift. But there’s no free-lunch and the ephemeral nature of containerized apps challenges teams to understand how a “now you see it, now you don’t” system impacts overall application performance. You spend countless hours developing and nurturing your code before sending it out into the real world. But once the world gets its hands on your app, anything can happen. Accelerating your digital transformation will often add new challenges to an already complex IT environment. Cloud, microservices, containers and IoT are just the start, and require flexible, modern approaches that put customer experience first and are built to be future-proof. CA Application Performance Management (CA APM) is engineered to address the challenge of improving performance across these dynamic application environments. In this webcast, we will discuss the top five reasons why you should consider CA Application Performance Management to help optimize your customer experience and performance across digital ecosystems. Providing a great digital experience is critical for your brand, but the complexity of monitoring modern apps presents a challenge. When you combine a mix of mobile and Web applications, containers and microservices in distributed environments, identifying when and why your customers are having a poor app experience is often difficult. Join us for this webinar where Bryan Whitmarsh, Director, Product Management at CA Technologies will demonstrate how you can achieve a 5-star app experience for your customers. See how CA App Experience Analytics leverages a powerful, open source analytics platform to provide user experience insights and deep visibility into performance across apps and channels. Containers and microservice architectures simplify the development process, provide environmental consistency and speed updates; however, there are operational trade-offs. The ephemeral nature combined with API-centric communications results in a massive increase in objects, dependencies and metrics – challenging traditional monitoring approaches, including: topology mapping, instrumentation, and static baselining and alerting. New monitoring techniques and approaches are now needed to gain visibility and control over these dynamic platforms across the application lifecycle. • What new monitoring, analytics and alerting techniques are best suited for containers. • Why an open data model is key to understanding and tracking microservice dependencies. • How to establish monitoring across the entire application lifecycle to increase development speed and quality. In this golden age of software applications, delivering a great customer experience at scale is a business differentiator. Microservices platforms, containers and cloud-native applications promise faster time-to-market but introduce unparalleled complexity. Added value can quickly be eroded by failing to understand and manage your application performance across environments that are in a constant state of change. Join us for this special webcast, where guest speaker Dean Davison, Principal Consultant, Forrester Research will discuss findings from the recent Total Economic ImpactTM (TEI) of CA Application Performance Management (APM) that can assist businesses evaluating this solution – including the potential to realize: $5.4 Million NPV, 316% ROI and payback in 3 months. Joining Dean, Pete Waterhouse, Advisor, CA Technologies will outline the essential elements of a modern APM solution needed to deliver these outcomes. Containerized applications and microservices challenge existing monitoring tools and processes. The ephemeral nature of containers presents massive tracking issues and the massive increase in objects, service and metrics makes traditional alerting obsolete. The collection of performance, usage, and error/crash data is a critical first step in building an application or infrastructure based analytics engine. Once collected, the normalization of this data into a proficient repository, that makes the data available to be analyzed, becomes the foundation of your Analytics initiatives. •Why leverage the ELK Stack as part of your analytics strategy? •Elasticsearch is just one component of a Lambda Architecture, what else can/should be used? •How you can leverage CA’s new Agile Ops analytics platform to predict performance anomalies, end alert storms and false positives and leverage machine learning for faster root cause analysis. Modern application technologies make it possible to provide a better user experience than ever before. With elevated end-user expectations, the difference between success and failure is an organization's ability to efficiently harness the power of complex application architectures to meet customers demands. An application performance management solution that sees through the data deluge to answer critical questions is more important today than ever before. Over the past 20+ years, IT has mastered the art of collecting performance and user data. But to succeed in today’s application economy, you need to learn how to take this information and evolve into a data-driven business. Your success hinges on ensuring that every customer experience is the best it can be, and that means gaining insight across the vast complexity of your mobile, web and application environments. In this session, learn how analytics can sort the wheat from the chaff in your performance data to highlight key business insights that will separate you from your competitors and gain you a seat in the boardroom. The new CA Application Performance Management (CA APM) Jenkins plugin helps organizations to leverage CA APM in the pre-production environment by integrating with Jenkins, one of the most popular continuous integration tools. With this plugin, the critical pre-production test data can now be seamlessly brought into Jenkins and presented in a unified cross-build or per build dashboard. It enables the users to configure build pass or fail conditions and automate the decision making process without any manual intervention. Watch this webinar to learn more and see the demo. Nishant Kabra – Principal Product Manager, CA Technologies Guenter Grossberger – Sr. Engineering Services Architect, CA Tech. Microservices, Cloud Foundry and Dockerized applications are adding a new layer of complexity to an already complex application environment. When application issues arise, it becomes difficult to pinpoint the source and, too often, you find yourself in lengthy war rooms or assigning experts to triage every issue. As a result, brand loyalty, customer satisfaction and innovation are negatively impacted. The old approach to application performance management just isn’t working. A new approach is needed. In this session you will learn how to monitor these new modern applications to ensure the customer experience. We’ll also demo CA APM in action monitoring a Dockerized application. The digital revolution within society is in full swing, as the rate of consumer-facing technological advancement accelerates to unprecedented levels. Your users have never been so tech aware, and businesses need to keep up in order to stay relevant in the current marketplace. The pressure on businesses is two-fold – not only do they need to successfully transform themselves and their processes, but they need to apply that transformation to their customers’ experience. So where do organizations need to focus their digital transformation efforts in order to be successful? And what part does analytics play in this digital revolution? How beneficial is a comprehensive and experienced analytics partner to organizations currently attempting to transform digitally? During this webinar we will discuss the difficulties organizations are encountering when undertaking their digital journey, investigate why some organizations are more successful at digital transformation than others, and take a look at the impact and repercussions of failing to successfully transform in 2017. Huge business challenges are also often opportunities, and where some businesses struggle, others will excel. Organizations today need to view digital transformation as their defining moment, and reap the benefits moving into the future. The Application Economy means that our apps are the face of our business, yet what impressions are they leaving? CA APM is the premier business enabler to help you drive app user loyalty so that every user transaction becomes a loyalty-building experience. •What is the quality of my user's experience? •If the quality is poor, why? In addition, we will explore how simplified monitoring makes CA APM easier than ever. Get total visibility into your app behavior with CA Technologies. Just a glitch in app experience can turn loyal customers into lost ones. While modern applications can be simple to use, behind a pretty face can be a complex array of microservices, APIs and other backend services. That’s why application performance monitoring and management solutions from CA can simplify the complex to help you find and fix problems fast—so you can deliver exceptional user experiences. This makes for happy customers. And happy customers make for healthy businesses.